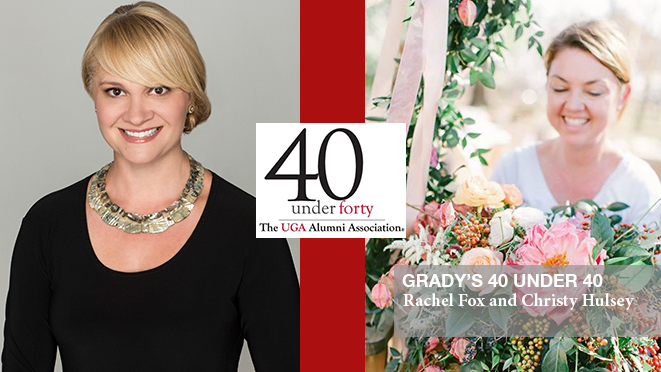 Grady College is proud to announce that six alumni are being recognized this fall as recipients of the UGA Alumni Association's 40 Under 40 award: Rachel Harper Fox (ABJ '97), Christy Hulsey (ABJ '98), David Mowery (ABJ '99), Eric NeSmith (ABJ '02), Elaine Reyes (ABJ '97) and Tracey Thomson (ABJ '00). Selections were based on the graduates' commitment to a lifelong relationship with UGA and their impact in business, leadership, community, artistic, research, educational and/or philanthropic endeavors. Grady College will release select questions and answers from two winners each week leading up to the ceremony on Sept. 18. Grady College: What class at Grady College did the most to prepare you for your current career? Rachel Fox: Back in my day, seniors majoring in public relations were given an opportunity to immerse themselves in real-life PR by tackling a campaign for an Athens-area organization/business. Although out of the classroom, this experience best prepared me for my first job. Together with three classmates, we put our years of Grady classes to work, creating and ultimately implementing a strategic publicity campaign for our first client! It was in the thick of this hands-on experience that I discovered my passion for public relations. GC: What skills and/or values and/or circumstances do you most attribute to your success? RF: First and foremost, I attribute my desire to be good and do well to my parents. Together, they did an outstanding job of laying a solid foundation as far as my values, morality and work ethic. From this foundation, as I have ventured into adulthood and the workplace, I have been able to sharpen a number of skills that point to my personal and professional success. Professionally, the most notable are: effective communication, innovation and building relationships. Being an effective communicator requires that you do more than just exchange information — you learn to understand the emotion and impact of the message and how to navigate confusion or conflict that arises. When you are innovative, you are differentiating yourself from your competitors. Those who are innovative are constantly challenging themselves to be the best and perform at an optimum level. In public relations, building relationships is absolutely essential. By nurturing relationships you maximize the talents of your team, client and stakeholders. Grady College: What advice do you have for today’s Grady College students? Christy Hulsey: Relax. Enjoy this season of your life as there's nothing else that compares to the life and times of a Georgia Grady student. Every moment you experience will shape the magnificent graduate you are about to become. Live it up! GC: What do you miss the most about being at UGA? CH: Having lived in South Georgia (St. Simons & Statesboro) since graduation and well before going to Georgia, too, I have to say that I desperately miss that cool, breezy chill of a soft Fall morning — that sensation that only exists in Athens, G E O R G I A. The warm humidity and salty air are wonderful but a strong, brisk, UGA daybreak wakes up my soul. I miss that. GC: What experience during your time at Grady College had the biggest influence on where you are today? CH: Hmm. That big lights, big city NYC Advertising tour led by Lee Wenthe did it for me. Visiting UGA Grady Alumni in the big apple, seeing their work, hearing their successes, touching the office doors of the world’s most acclaimed agencies, was inspiring. It's the things dreams are made of… totally inspiring. It showed me that the sky's the limit when you have a journalism degree from UGA. To see the international recognition of our school and degree established a pride within me that's never left my mind, nor my values. Whether I'm working with a client in San Francisco, Paris or Savannah, whether it's Pottery Barn HQ or The White House or the neighbor next door, I'm pride full of the bold statement my Grady degree exudes. For more information about the 40 Under 40 program, see http://www.alumni.uga.edu/40u40.